Join this “Citizen Science” project, the longest continuously running bird data in the area. Contact Dave Small for additional information and to participate in this nationwide annual event: 978-413-1772 or dave@dhsmall.net. Note: team leaders and participants will meet this year at the Millers River Environmental Center 100 main Street, Athol. We will meet between 6:00 and 7:00am and plan to hit the field by 7:00 am. We’ll have coffee available and potluck breakfast treats to share would be great to bring. Join the gang for a pot luck dinner as we tally the days findings! You don’t need to have been in the field to join in the fun of discovering what birds are located here in the area. Join with the newest member of the Millers River Environmental Centers Partners NQTA for a pot luck breaking bread time at 6:00 PM followed by a presentation by Tom Wansleben, Mount Grace Land Conservation Trust biologist on the Owls of the North Quabbin Region. This event will be held in the main room at the Center. Our annual ritual to Massachusetts’ premier winter birding location. Meet at 7 a.m. at the Center, or call ahead to join the group at 9 a.m. at Friendly’s off the Rte 128 circle in Gloucester. Bring snacks and EXTREME cold weather clothing! Info: Mark Taylor 413-498-4380 or birdnorth@hughes.net. Wednesday, January 9, 7 p.m.
Our regular meeting here at the Center heads north! Bill Thompson has been an avid birder for more than 40 years and an avid bird photographer for the last five. He has lived in more than a dozen states, most recently in Alaska, before moving to Greenfield in 2010. He currently works for the US Fish and Wildlife Service. Fri., Dec. 21; 6 – 9 p.m.
A holiday celebration for hikers and those who dare! This romp will be on carriage width ski trails at Northfield. Our headlamps will light the way on this longest night of the year as we share facts and quotes to celebrate the winter solstice and explore the prophecy of the ancient Maya. A visit to a mid-mountain campfire and shared cider and snacks will sweeten this night as we turn towards the sun. Participants must bring a headlamp, dress in layers for hiking in winter weather and expect to hike 1 – 2 miles with an elevation gain of 300 feet. If our trails have sufficient snow, snowshoes are required. 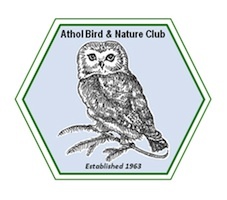 A while ago I asked for some help in developing an updated logo for the Athol Bird and Nature Club. Our gifted artist and friend Elizabeth Farnsworth of Royalston jumped on the challenge and came up with the images below which were selected by the Board of Directors from the several drafts offered. We’ll be incorporating these images into the updated web pages letterhead and elsewhere… Could be some new car decals and hats in the making… Stay Tuned.. Thanks Elizabeth for a great job. Still shopping for the perfect Christmas or Holiday gift? A 2-year subscription to Massachusetts Wildlife magazine ($10) delivers eight full-color issues of the Commonwealth’s best wildlife publication. For the budding conservationist, try a copy of the Critters of Massachusetts book ($5). Critters is a great gift for the curious youngster or the beginning adult naturalist with an interest in backyard wildlife and beyond. For the more advanced naturalist, the Field Guide to Dragonflies and Damselflies ($20) or A Field Guide to the Animals of Vernal Pools ($12) might be just the ticket. In-depth descriptions and detailed photographs help the reader identify and learn more about these creatures. For the budding herpetologist, there are a couple of options: The Field Guide to the Reptiles of Massachusetts features information on breeding, feeding habits, range, habitat, and conservation issues. This unique issue of the Massachusetts Wildlife Magazine is $3 per copy and also offers spectacular color photos of the various species, including color and pattern morphs of those species with variations and a list of key features that allows you to identify any native snake or turtle (except sea turtles) found in the Bay State. The turtle enthusiast in your life may also enjoy the Introduction to the Threatened Turtles of Massachusetts ($5), a video available from the DFW’s Natural Heritage and Endangered Species Program. Go to www.mass.gov/dfwele/dfw/publications/publications_home.htmor call the West Boylston Field Headquarters at (508) 389-6300 for further purchase information.